At the Southfield Area Chamber of Commerce we operate as a catalyst that creates connections, while embracing these five values: following through and keeping our promises; making relationships our business; serving the community with a passion; committing ourselves to excellence; and being forward thinkers, always willing to explore new opportunities. Above all, the Chamber is a business resource, and wants to remain connected with you. We are delighted to extend to you an invitation to join the Southfield Area Chamber of Commerce. We provide you with a wealth of valuable business resources designed to help you reach your business goals. At the Chamber, we are committed to the success of our members and pride ourself on creating connections that drive and strengthen businesses in Southeast Michigan. 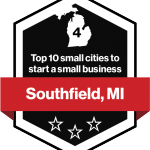 The Southfield Area Chamber of Commerce is a full-service Chamber representing the cities of Southfield and Lathrup Village. By consolidating resources from several hundred businesses (large and small), the Chamber works collectively to support our members as we build a healthy economy and improve the quality of life in the greater Southfield community. Our relevant and informative initiatives and programs are designed with our members’ input and through partnerships with local businesses. As a member, you have access to a wide range of resources. From signature networking events to online marketing tools and discounts on business services, the Chamber connects you to the people and services that can strengthen your business. Enjoy seminars, press release distribution, searchable business directories, online referral services and more. Each year the Chamber carefully evaluates member needs to ensure the programs and services we offer provide a maximum return on your investment with tangible benefits. If there are specific resources or needs that are not listed - please ask! We are here to help you. Tanya Markos-Vanno, Executive Director | Tanya@SouthfieldChamber.com | (248) 557-6661.